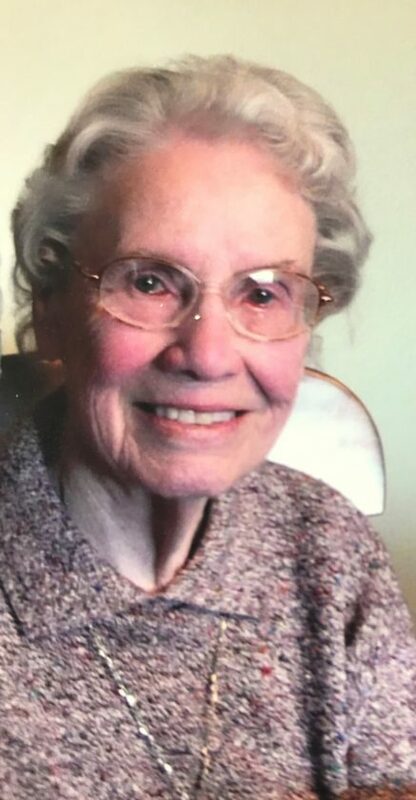 CRYSTAL FALLS — Margaret E. Davis, 100, of Crystal Falls, passed away Sunday, April 7, 2019, at Aspirus Iron River Hospital. She was born March 15, 1919, in Crystal Falls, the daughter of the late Charles G. and Hulda (Stolberg) Johnson. On April 17, 1945, in Crystal Falls, she married Clinton Davis. He preceded her in death on Jan. 22, 2006. Margaret graduated from Crystal Falls High School in 1936. After graduation, she worked at the F&S (Finnish-Swedish Mercantile Association) as a clerk. From the 1940s to the early 1950s, Margaret worked as a secretary for the M.A. Hanna Mining Company. When her husband started the Davis Flying Service offering charter service and G.I. flight training, she became the secretary and bookkeeper. In 1954 when Clinton joined his brother in the excavating business, Margaret continued her secretarial and bookkeeping duties for that business until they retired in 1998. Margaret was a member of United Lutheran Church of Crystal Falls. She enjoyed sewing and outdoor work in her earlier years and continued to enjoy bookkeeping well into her mid-nineties. Margaret enjoyed corresponding with her Swedish relatives in Finland and could read and interpret Swedish for the rest of the family. She was the family historian for all of the family. Margaret is survived by 14 nephews and nieces, Robert (Louise) Ahola of Crystal Falls, Susan (Frank) Foley of Dallas, Ga., John (Pat) Ahola of Crystal Falls, Barbara Reed of Santa Clara, Calif., Carol (Larry) Conwell of Chilton, Wis., John W. (Peggy) Davis of Grand Junction, Colo., Leroy Davis of Parachute, Colo., Toni Carpening, Edward Davis of Tucson, Ariz., Glen (Lisa) Davis of Titusville, Fla., Peggy Davis of Viera, Fla., Lynne Davis of Wichita, Kan., Laura Stebbins of Okemos, and Mary Beth (Dennis) Fineout of Eufala, Ala.
She is further survived by one sister-in-law; many great-nieces and nephews; and many great-great-nieces and nephews, other relatives and friends. In addition to her parents and her husband, Clinton, Margaret was preceded in death by four sisters, Sigrid Rosengren, Lillian Ahola, Catherine Bishop and Helen Johnson; one brother, Carl Johnson; several brothers-in-law and sisters-in-law; and other relatives. Private family visitation and services will be held at the Jacobs-Plowe Funeral Home of Crystal Falls. Burial will be in Evergreen Memorial Cemetery in Crystal Falls in the spring. A special thank you is expressed to family and friends for all their help and support. The family would also like to thank the staff at Victorian Heights Assisted Living and the Iron County Medical Care Facility. You may leave a condolence or tribute for Margaret’s family online at www.JacobsFuneralHomes.com. The family has chosen the Jacobs-Plowe Funeral Home and Cremation Services, Crystal Falls, to honor Margaret’s legacy of life.